Knitting fool – c’est moi! For the last few months I have been itching to learn to crochet. Why? I guess it was always something that seemed interesting to me. In addition to this, I have fallen in love with the beautiful work that Bethany has made and shown in her Flickr albums. I found out that my grandmother and two aunts actually crochet, but with their busy schedules and my kids we have not been able to figure out time for lessons. My desire to do something with yarn finally made me take a plunge. With some help from Laura I decided to head out get some new knitting needles (not sure where my old ones are – probably still at my parents house). So last weekend while NHL and JL were at a birthday party, I walked with JSL to Michael’s to get something for a project. I decided to make something simple that I should be able to finish. So, I am knitting a scarf for the little guy. They do not sell scarves in stores for babies and since baby necks get cold I am making him one! Laura came over Monday to help me to asses the items that I bought (and pick up her Trader Joe order). I could not get the bamboo needles in the size that she suggested, so I stuck with the metal ones (I learned on those when I was in elementary school – so they work for me). The show off got me started with two rows. She wanted to see how many stitches to use. Later I counted and she supposedly thought that 49 was the perfect number. I do not have a lot of time to knit, but it is therapeutic to do before bed to help me to relax some before going to read and passing out sleeping. How sad that the first night I sat there with my laptop and knitting so I could get pointers from Laura on what I was doing wrong since my poor hands were killing me. She had to remind me to relax my hands from death gripping the needles. . . ooops! Since then I have really gotten the hang of it and my hands only start to bother me after more than 2 hours of torture knitting. This is a nice break from typing/blogging and gives me a different type of obsession project/goal. Man can you tell I am getting punchy and my eyes are bloodshot as I type this after knitting for the last two hours?!?! 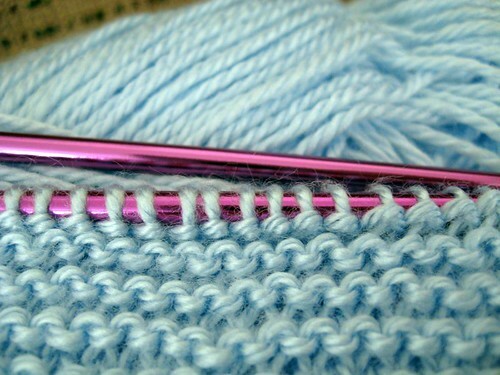 Here is a sneak peek of my knitting. The scarf is very wide for a baby, but I hope to tuck it under his coat some to protect from puke keep his neck warm. Plus an added bonus is that he can use it next year, assuming we do not misplace it. These photos were taken Thursday after knitting for a few hours. Since then it has increased a little more thanks to another 2-3 hours of therapy. Another close view with the shiny purple needles. I will keep you posted on my progress. I hope to finish this before winter so JSL’s neck can have some protection from the cold weather that is coming back. Next up, learning how to purl again. This time I am doing a straight knit since it has been over two years since I have done anything. Laura has said she will teach me again and thinks she can show me how to make some mittens. I will believe that when I see it. Who knows, maybe someday I will be a yarn snob just like her. Thanks Laura for your help and who knows you may get laughs from me one day about turning a heel on socks – LOL! That’s very pretty. Keep it up and when he’s older you can make a tallit for his Bar Mitzvah. I made one for my nephew and he loves it. feefifoto:Thank you! 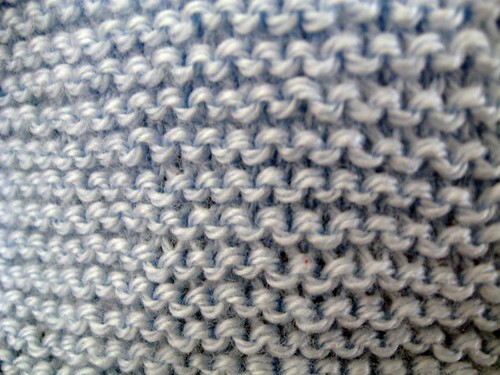 It is just a plain knit. I am trying to get back into this to give me a hobby (beside blogging) to do. LOL – With my track record and projects, I should get started. After all, I only have a little over 8 years to make a tallit before his Bar Mitzvah ;) Do you have any photos of the one you made for your nephew? I would love to see it! A neighbor taught me how to knit.. I could get that but perl confused the heck outta me. So I stick to crocheting and wire ‘knitting’. 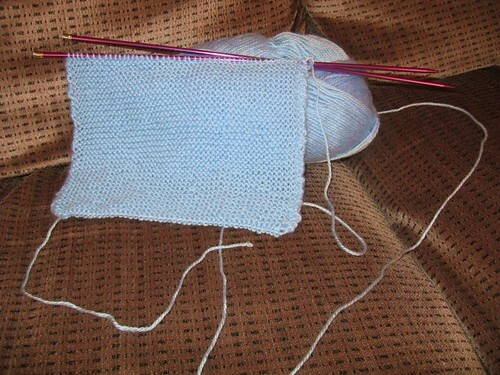 Kmelion: When I was in elementary school my Aunt T taught me how to knit. I had a horrible time with it. Then my neighbor across the street (a sweet elderly woman) said she would help. She watched what I was doing and realized that my aunt had taught me to purl, not knit. She showed me how to do that and I was able to do it quickly. My neighbor friend and I used to go over to visit with the woman and sit on her porch and knit together. I would also go and walk to my Nana’s house to knit with her when I was little. Ah, the memories. Since it has been over 20 years since I tried to purl I am going to give it another shot. Hopefully my friend Laura can help me to do it.